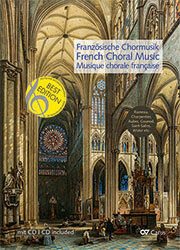 The choral collection Hallelujah. 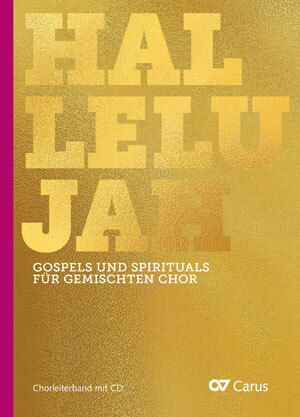 Gospels and Spirituals transports us into the fascinating world of African American folk songs. 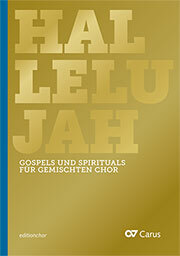 30 gospels and spirituals have been arranged for mixed choir, unaccompanied or with piano. The choral parts sometimes divide, and occasionally solo parts (or even a small choral group) are required. As well as American classics (e.g. Amazing grace, Go down Moses, Kumbaya, Deep river, Down by the riverside, Good News, O when the saints, Nobody knows, Joshua fit the battle of Jericho), the collection also contains some discoveries from the beginnings of the genre. Just under half the arrangements were specially commissioned for the collection. 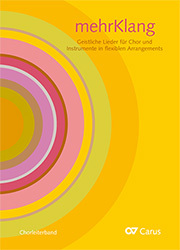 Young composers from the USA (such as Courtney Carey, Marques Garrett) and arrangers from Canada, Denmark, and Germany (including Mark Sirett, John Høybye, Thomas Gabriel, Carsten Gerlitz, Gunther Martin Göttsche, and Hans Lüdemann) have contributed to this stylistically extremely varied choral collection. The medium difficulty level will enable many choirs to get to grips with the gospel style, something which perhaps few of them are very familiar with. Tips from the editors on performance, and a CD recording with a selection of the arrangements will help with learning the pieces. With their deep and emotional symbolism of captivity and repression on the one hand and redemption and freedom on the other hand, these Gospel settings are well-suited for many uses in concerts and church services.